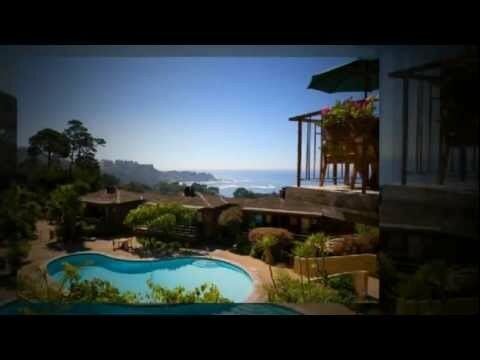 Stunning ocean views and world class fine dining in Carmel, CA. Meandering your way down the Pacific Coast Highway, just south of Carmel, you’ll stumble upon the Hyatt Carmel Highlands. It’s stands out like no other property in the Hyatt collection of hotels. Getting there is half the fun. Travel south on The Pacific Coast Highway (PCH). When the road starts to ascend just passed Point Lobos you’ll come to a sharp hairpin turn in the road. That’s your cue to make the next left into the Hyatt Carmel Highlands. Crack your window and smell the wood burning from the in-room fireplaces as the switchback takes you to the Inn’s perch high above the Pacific Ocean. Upon arrival ascend the landscaped grand staircase and get to know your new digs. It’s got an interesting history. The hotel’s beginnings date back to 1916 when the main lodge was raised and the Inn opened it doors. With a little luck and good fortune Hyatt acquired the property and has been a good steward ever since. They’ve updated the original building that was the Inn but kept the ambience and charm. The forty-eight guest rooms are built on a terraced layout on the Pacific Coast hillside. They sit amongst a mature grove of California pines. Many of the units have stunning panoramic views of the Pacific Ocean and have private decks, wood burning fireplaces and Jacuzzi soaking tubs. There are also several rooms located in the original Inn. We were fortunate to stay in the ‘The Point Lobos Suite’, which had stunning panoramic views of the crashing surf. The suite is located down a curvy private stone path off the main entrance of the original Inn. You feel like you’re checking into a private apartment and the best is yet to come! The suite is designed for privacy and function. A small entryway with a wet bar leads to a generous living and dining room setup with a wood burning fireplace and flat screen TV. The space can easily accommodate a family or function as a day office. It’s hard to think that anyone would be able to concentrate with the panoramic views of the Pacific Ocean from this room. Especially, when you are using the complimentary binoculars to look at the sea otters and seals. At the other end of the hallway is the master bedroom. The décor is minimalistic-modern. The use of neutral colored fabrics and the dark accents used in the furniture play nicely against the ever changing scenery through the sliding glass doors that lead out to a multi-tiered stone patio overlooking the ocean. Please be careful to not leave the wood-burning fireplace going when the patio doors are open. The extra draft may stoke the fire too much. The master bath also had great views from the oversized onyx Jacuzzi. There was also a third wood-burning fireplace located opposite the soaking tub. This is a very unique feature and we’ve never encountered this setup before in a luxury hotel. The master bath also had double vanities, a separate marble rain shower and private loo. It’s the perfect place to relax after an amazing day exploring the Big Sur coastline. Order Champagne and draw a bath. Room service is prompt, polite and plentiful. Pricing for the Point Lobos Suite ranges from $525 to $800 per night. A standard room with ocean view ranges from $295 to $600 per night, depending on the season. The hotel amenities include complimentary parking, free business center and free wireless high-speed Internet access. All 48 guestrooms, including 11 suites, have been recently renovated and feature comfortable minimalistic-modern furnishings. Guests can enjoy in-room fridge, DVD players, iHome stereo, iPod docking station. They can also take advantage of the concierge, babysitting services and complimentary valet. Enjoy the heated outdoor swimming pool and three outdoor Jacuzzis. Pamper yourself with the in-room spa services, and yoga. Stay fit at 24-hour fitness center. The hotel offers a choice of two dining outlets which include the California Grill and the Pacific Edge restaurant. Please stay tuned to our reviews on both of these restaurants on the famtripper.com travel blog. If listening to live music is your thing, then relax in the lounge, which hosts live entertainment on select nights.